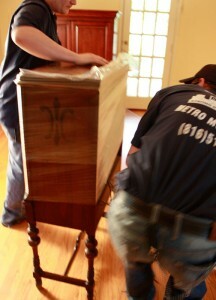 Need help moving an old armoire to the attic or rearranging your furniture? Want to send that grandfather clock in your basement to your sister across town? Need someone with a truck to pick up a bookcase you bought and the store doesn’t deliver? We Can Help! Single Item moving and delivery services are more affordable than you think! Our team can move an item from one end of your house to the other or help you transport a specialty item, such as a piano or a pool table. We specialize in moving antiques and understand that moving mature furniture is all about being delicate and capable, as many of the pieces are extremely heavy and fragile. The more susceptible to damage the item is, the more care we know needs to be taken. Don’t hesitate to give us a call to inquire about your specific needs – we got it covered for you! If you need a strong helping hand, call our movers in Kansas City at 816-517-0560.